With Royal Challengers Bangalore (RCB) deciding not to retain Chris Gayle in the player retention, they will be on the lookout for an explosive opening batsman to partner Virat Kohli. Gayle's compatriot Evin Lewis is the ideal replacement for the Jamaican, who has been incredibly successful in the IPL. Not only is the southpaw a proven big-hitter much like Gayle, he has also shown himself to be incredibly consistent in the T20 format, an average of almost 35 and strike rate of over 145 are a testament to that. Although he has never played in the IPL, this could be the perfect opportunity for him to come in and make an immediate impact, much like Gayle did when he was signed by the franchise as an injury replacement. 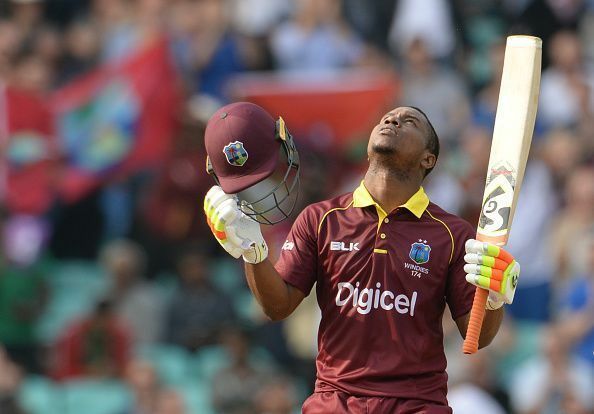 Evin Lewis has made a name for himself in the T20 arena with his explosive hitting at the top of the order. The 26-year-old is one of the finest T20 players in the world at the moment and his record in the format is nothing short of outstanding. However, he has never featured in the Indian Premier League but that looks likely to change this year. Ahead of the IPL Auction 2018, RCB surprised many by choosing to not retain Chris Gayle and instead of picking the young Sarfaraz Khan ahead of the West Indian, along with Indian captain Virat Kohli and South African batsman AB de Villiers. RCB are looking to start afresh in IPL 2018 and have roped in India's 2011 World Cup-winning coach, Gary Kirsten, and Ashish Nehra, as batting coach and bowling coach. They will be looking to revamp the side and use their RTM on the likes of Yuzvendra Chahal or Samuel Badree instead of Gayle. The 26-year-old Lewis has been impressive for West Indies in both ODIs and T20Is and can make use of the small boundaries at Bengaluru to make an immediate impact. He will certainly be a useful addition to the RCB side that is looking to rebuild ahead of the 11th edition of the IPL. Although Lewis missed out on the T20I series against New Zealand, he is likely to be one of the biggest attractions of the IPL Auction that will take place in Bengaluru. With short boundaries at RCB's home ground, they could certainly use an explosive batsman at the top of the order and Lewis certainly fits that criteria. He has the ability to take the game away from the opposition single-handedly and will be the ideal replacement for Chris Gayle.